My work on the novel was erratic this week but not totally abandoned. I think I worked on it 3, maybe 4, days. Usually I was working quickly before some other appointment so I didn't have time for my customary unwinding on this blog. I got through the rewrite of Chapter 2 and started Chapter 3 yesterday. One hard part has been ignoring how in a very basic way the book gets worse and worse as I go along. I'm making a mess out of it. But that's necessary work to sound the depth of it. So I just try to judge it by whether or not everything necessary is in there somewhere on the theory that I'll come back later to bring the important parts into clearer relief. I'm hoping that I've fully developed Chapters 1 and 2 finally and am close to doing that for Chapter 3. By the way, I looked at the length of those first three chapters, and they are all three times as long as they were in the first draft. That's not counting all the scraps I've already cut out, which is usually around 10 pages/chapter or more. That means I'm on track to have about a 350,000 word second draft typescript--about 650-700 pages if it were all printed. Which it wouldn't be unless some publisher loses its mind. I have it in my head that this is about a 250 page story, so I'll have a lot of cutting to do. I continued work on Chapter 2 today. This chapter has always been a clunker, though I suppose I'll think the same thing about later chapters. But it's a draft, so I'm not kicking myself. It came out the way it needed to in order to find the end. One of the characteristics of my drafts . . . I've always had trouble putting my finger on it. But today it came to me a little. They places where they get most dull is a long series of very brief events. Like a bird skimming along and just barely touching down, one episode after another. It's like X went here and next went there and next went back here. Each of those scenes is doing a little bit of something--not enough to be interesting but enough that I hesitate to cut them. I feel like I need something in what's being established at those points. In Chapter 2 today I was able to gather up about 4 of them and make one single episode out of them. The balance is better. It eliminates the stop and go feel. It eliminates the repeated sensation of "so what?" Probably this isn't a replicable strategy, but if there are other places where I have a lot of that skimming I'll be able to diagnose it and use this trick. Boy, why is it necessary to learn how to write a novel at the same time I'm writing it. It really slows things down. I'm printing out part of a chapter and sharing it with a reader. This is impulsive and not strategic. It's not a reader who can help me get it done--in fact probably the opposite, since they are close to the story. It's not a chapter that is ripe for attention. It was simply an offer to show this particular section since something in a conversation with this person reminded me of the chapter. I thought they would be interested to see how I shaped the real (shared) experience into fiction. So I'm going against every bit of advice writers get about when and how and with whom to share their drafts. But there's still something powerfully clarifying about it. In getting the chapter ready--a quick read-through to cut out anything that would just be confusing at this point--I'm forced to see it through this other person's eyes. It's not the ideal other person, but still another person. And seeing the chapter that way is disruptive and illuminating. I think I've talked in other posts about the old saw that you should write with a particular reader in mind. e.g. Picture a person and write as if you were telling the story to them. In my case, that didn't seem necessary or even possible in the first draft, but I can see how it's helpful at certain points later in the process. So far, during the rewrite I haven't done that. But this errand of getting one chapter ready to share with this one reader reminds me of the power of writing to one reader. The next time through the book (the revision of the rewerite?? ), I think I will use that strategy. I'll be thinking about who my ideal audience or reader is, I'll boil it down to one person, I'll get a commitment from that person to read the work, and I'll revise the book with them in mind. Suffering today from playing basketball--in pain and moving slow from lack of sleep. I got about 1:15 of work in. Hard to concentrate. Chapter 2 has some serious problems with it and I'm torn between two possible solutions. It's very long with some long boring parts in it. On the one hand, I'm tempted to break into two chapters and try to develop the boring parts into something meaningful that more closely connects to the story. On the other hand, it might be better to chop it all out and try to handle that material in just a couple summary paragraphs. The problem is that within the long boring parts there are elements that I feel are important to establish. I can't lose it all. What's the best way to get them established? I overslept and got in about 90-120 minutes of work this morning and then was interrupted by a phone call. I could have ignored it, but I don't have the discipline when I think it might be about my income-generating work. In that time, I went through about 14 pages of Chapter 2, which is very long, so figure at least three days of work at best. I didn't end up making a lot of changes, which makes me a little uncomfortable. Am I having trouble seeing the forest again? It could be the necessary emphasis for this chapter won't be added so much as brought into relief by editing out what isn't necessary. There is certainly a lot of that to do. To that end, I struck a compromise between, on the one hand, digging into the shuffling and cutting of big sections and, on the other hand, ignoring all that and staying focused on developing the work, which I promised myself yesterday that I would do. My compromise was the to start using the "add comment" feature of word and making e-notes in the margin about the shuffling and cutting that occurs to me now but that I will work on later. I'm also indulging a preoccupation with continuity errors that is better left to later edits. e.g. I have a lot of extra characters who might be referred to as ____, as X, as Smith, as Jones or as one of a few different names I tried out for them. Those will need to be straightened out, and I've started to keep an index as I go through to track them later. Same for exposition of the geography . . . at times I have my character's house on the east side of town and at times on the north. I don't know what to call it--the rewrite of my rewrite--but I finished going over Chapter 1 after the major rethinking I've been doing. I took my focus questions, applied them to this material, and rewrote or developed a few scenes to make it all more closely align with (or set up, actually) the rest of the story. That was a bout three days of work. So maybe I can do the same with chapters 2-4 in the next couple weeks and get myself back to the point in the rewrite where I've been stalled since early January. In reality I think where I am with Chapter 1 is finally having finished what anyone would call a strong first draft. I say this because my first draft didn't amount to much to more than a scaffold with no real movement or development and what I've been working on is developing it all. I also say that because I am suddenly very preoccupied with problems of shape, organization and flow. When I notice things that don't work about chapter 1, it's less about where the story doesn't make sense or feels dead than it is about where it slows down or has unnecessary detail or doesn't have the impact I want because things are presented in the wrong order. My creative energies are drifting toward how I can move things around to bring out what I really want to emphasize. Anyway, for now my mantra is "just keep developing it." Go deeper. I didn't get through the end of the day yesterday before I rethought my timeline again. Still so much work to do on Chapter 1, since the changes I made have implications for the climax of the chapter. So I started the morning thinking I need to go through each chapter carefully. As I went along I kept discovering more and more problems, but they were less in the realm of development than in the realm of organization and emphasis. I felt like attending to the fact that the chapter is about twice as long as it should be and the main stuff in it takes too long to get to. So I started moving things around. It's more like editing than rewriting/developing. Very roughly. I worked for about an hour and when I came up for air I had the sense that I could keep going for awhile. So now I'm hoping that at certain stages along between rewriting and fine tuning, it will involve a kind of work that doesn't take so much intellectual energy so that I can sustain the work for several hours a day and pick up the pace of progress. It has been my experience in the past with other projects, that I have much more stamina for sentence-level editing than I do for drafting. I hesitate to say when I'll be able to do that, but when that stage comes I'll try to arrange my life so that I can put in hours a day on it. Right now I have to get to my paying job. This work is so humbling. During the rewrite process I don't think I've had a single day when I started and ended with the same sense of what the timeline and scope of work are going to be. Every time I think I know what I need to be doing, the path closes up and I have to bushwack until I find another one. Today, I'm ending with a feeling that I've gained some time back compared to the course I thought I was on when I started this morning . . .
Over the last week or so I haven't been writing any but I have been doing a lot of thinking, note taking and brain storming. I went through my outline of all the chapters and made notes on what needs to be added to bringing them into closer alignment with the main path of the story. Scenes to add. Scenes where the dots need to be connected better. I also did a lot of brainstorming on a complicated subplot and where it will get developed. That left me feeling like I basically had to start the rewrite over again. For example, Chapter 1 needs XYZ changes to get it focused. That's been scary, so I've been procrastinating. Really I dreaded it. It now feels like it will take years to finish. So I started today finally, making a fresh copy of Chapter 1 and going to work on it. As I did that, though, I got the idea that maybe it won't be so slow. I needed two basic things to be established. In one case it required a new scene entirely and in another it was expanding and deepening a scene. I did that in a quick hour of writing. Just punch them in there. It's messy. The transitions don't work and the new materials is probably too abstract to be really interesting. They are probably in a tone that doesn't fit with the chapter. The rest of the chapter will need to be checked for continuity with the new material. But, in a sense, I got done the big changes for that chapter that my rethinking in the last couple of weeks has provoked. If I want, I can go on to do the same thing with Chapter 2 tomorrow. And if the pattern follows, I can do a lot of the big fixes in the chapters that I've already done my first rewrite on in about a week. That would bring me up to Chapter 5, which I've been stuck on for awhile, and continue my rewrite from there, with more focus than I have had up until now. That's the plan today. Let's see how I get humbled tomorrow. I had a brief good start today, and then I got distracted. Anyway . . . I tried an exercise recently where I just made a list of the thematic and plot questions that my story was struggling with, overall and by section. In the first brainstormed list, I didn't try to focus the questions too much, but bt by this point I know the material well enough that they came out pretty focused anyway. Next I re-wrote them graphically. 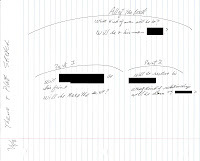 I made a big curving line across the page for the whole book and two smaller curves underneath for Part 1 and Part 2. It looks like a wide forehead and two eyebrows. Underneath each arc, I wrote my three pairs of questions. It felt like progress and my hope is that I have the kind of guidestar that I said I needed in yesterday's post. I feel like I can open Chapter 1 and attack a rewrite of it with a lot more confidence by shaping it to present and start answering the appropriate questions. Update: This little drawing turned out to be a huge aid in the last year. It finally got me started on my first complete rewrite and guided me in subsequent revisions. Whenever I was dealing with a scene that seemed to go nowhere and do nothing, a glance at this (taped over my computer of course--I even took it on my long trip overseas with me last summer and taped it on the mirror in my hotel room) showed me how to develop the scene to make it work for the plot and character development. I don't remember the exact quote, but Toni Morrison talks in one of her interviews about how in the drafting process she's looking out for the one metaphor that will carry her through the book. She says once she has that, she knows what the book is about and the rest just flows. I thought of that today as I was trying to work on the book--really struggling--and had this image of what it would be like not to struggle. It was a fleeting sensation of having some kind of guidestar that just made it obvious what I was supposed to be doing all the way through the book. I'd be glad to work hard on all the rewriting and revising necessary, if I just knew what to do. My real problem for the last few months is I just plain don't know what I'm doing. This sensation for a second this morning, as I thought I was glimpsing that kind of clear path ahead of me, felt like a major relief, and for a second I felt I just had to have something like that. That it would take away all the burden of this rewrite process. I don't think I have it though. Maybe I can split the difference and say that I have one for Part 1 and one for Part 2, and even that I'm not sure of.